Copyright photo by Gotch @ Harizanmai tattoo Studio. I think that getting a tattoo can be a powerful ritual. There is a deep level of commitment, as well as the sacrificial offering of pain-endurance involved. Done consciously, having symbolic patterns punctured into your flesh is a way of saying, "Yes. I accept and integrate this into my body and person for life." The permanant visual reminder also serves as a touch stone. Lost your devotion? Want to regain your power or meaningful quality? Look at your tattoo. Tap the body memories of it. Become it again. Tattoos are a heretical art. Many religions expressly forbid tattoos. As far as I know, the Hindu religion as a whole does not disallow tattoos. Of course, sects will differ, and keep in mind that Hindu cultural values are rather conservative on most things. Mendhi is a beautiful example of Indian body decoration for women, but it is not the same as tattooing. Anecdotally, I have concluded that the majority of people who get body art with religious symbols are not strict followers of religious protocols. Rather, they find their own meaning and create their own rituals to access their spirituality. Even though tattoos are now commonly accepted, there is still a bit of rebelliousness and an independent streak running through most people who get them. Do you think borrowing religious iconography from a religion you do not fully practice is disrespectful? Certainly, some of that religion's leaders and many followers would think so. But does it really matter to you what they think? It's an important ethical consideration, one that only you can truly decide. On my wedding day, I was keenly aware of the fact that my Jewish husband's religion has some hard rules about tattoos. If you have tattoos (and I do) then you are not allowed to be buried in a Jewish cemetary. My dear (but now former) husband isn't devout, so that wasn't an issue. And my husband's adult daughter isn't devout either--she's covered in tattoos. She and I both decided to let our tattoos show that day (she was a bridesmaid.) There is so much about Judiasm that agrees with me, but being part of a religion that would not accept me as I am? Unhesitatingly, no. My devotion and intent shall not be judged by anyone but the God of my heart. And for the record, my idea of God is bigger than religion, which I see as a pathway--not the destination. Hindu inconography is especially beautiful. Vivid. Intricate. Imbued with rich meaning. For these reasons, it's particularly well-suited for body art. And as you know, in the last couple of years there was a whirlwind of Hindi art passing through fashion and interior design. Those of you who are long-time readers of my articles on holistic business management might remember how I'm at the point that I find the plethora of buddha art to be kitschy and annoying. I have to say that I feel similarly about the glut of cheap-looking Hindi art. Yet that says more about my aesthetic--I like high-quality design. And when it's done well, I'm irresistably drawn towards East Indian design--and if there is a Ganesh somewhere in the building, I'll find myself standing in front of it. Perhaps it is drawn towards me, too? I swear Ganesh plays affectionate hide and seek games with me, reminding me that I am protected and adored by his benevolent spirit. I've thought about getting a Ganesh tattoo. It's not a consuming thought where I'm researching and planning designs. Mostly, I notice Ganesh tattoos, hoping to find one that inspires me. Usually, they look cartoonish or it's clear that the artist was trying to make it look hip--without there being any real spiritual intention emanating from the piece. It's the same with statues. Rarely do I feel Ganesh's energy coming through the work, but when it does--wow. It's really powerful when the symbol, the design, the artist, and the medium all come together. If I ever meet the right tattoo artist, perhaps then I will get a Ganesh tattoo. ...or maybe just a little mendhi will do. 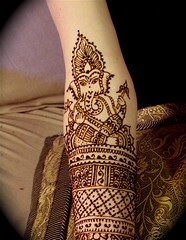 In fact, I think this henna Ganesh is absolutely delightful! close up of ganesh Originally uploaded by darcitananda.